German automaker Audi is expanding its boundaries with a new mobility service. “Audi At Home” allows a resident of LUMINA condominiums in San Francisco and Four Seasons Residences in Miami reserve and drive a vehicle from Audi’s line at her convenience. The initiative shows that Audi is a mobility service brand in addition to an automaker. “Whether residents are current vehicle owners or not, Audi at home offers access to a range of premium vehicles that can be tailored to their needs,” said Thomas Schneider, mobility manager at Audi. “For instance, let’s say a resident is an SUV owner, but desires a sporty cabriolet for a weekend jaunt: Audi at home allows them access to a fleet of premium up-to-date vehicles at their leisure. “Additionally, the service can be used by visiting guests,” he said. The program is available on both coasts, albeit only in San Francisco and Miami. Expansion to other cities in the United States is in the works. Residents interested in the service register through the LUMINA or Four Seasons’ concierge and then make a reservation on an Audi vehicle through the service’s mobile site. 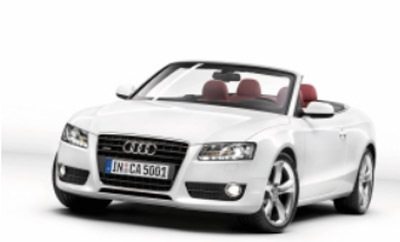 Vehicles currently include the S7, S5 Cabriolet, SQ5, TT, Q7 and RS5 Cabriolet. Consumers can be billed either hourly or daily. Rates include cleaning, fuel, insurance, local tolls, 24/7 customer care and no mileage limit. Because the service is currently limited to luxury residences, many consumers may have their own car. However, those with families and teenaged children who may need a vehicle on occasion would find the service useful, as would those who simply want a change of pace and to drive a different vehicle. In any such case, Audi is giving the consumer a test drive and building a relationship that could come into play when the time comes to purchase a vehicle. Additionally, young consumers are increasingly eschewing the purchase of a car in favor of convenient and spontaneous services such as Uber. As the Audi At Home service expands, it offers an alternative to both car purchases and Uber for those who prefer to be in control or take a drive once in a while. 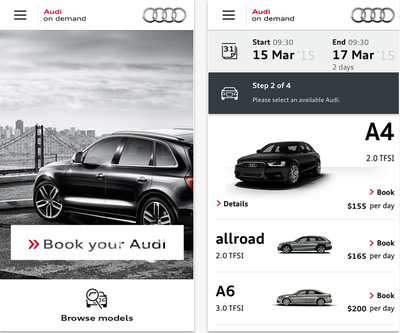 In April, Audi launched Audi On Demand in San Francisco, which allowed consumers to “order” a vehicle on the program’s mobile app. The vehicle would then be delivered to the location of the consumer’s choice for temporary use (see story). The two initiatives are only seven months apart, which could further indicate an attempt to move into mobility services rather than purely selling vehicles. Other luxury automakers have also innovated to compete with services such as Uber. Last year, BMW Group launched a new car sharing service application for London natives to have access to the automaker’s vehicles in three of the city’s boroughs. The app will allow users to know where the nearest available car is located and consumers can use their membership cards to access the vehicles. BMW’s participation with DriveNow will allow aspirational consumers to interact with the brand’s vehicles, which may lead to loyalty among the drivers in their future (see story). Providing consumers with a functional test drive is also increasing in popularity. German automaker Mercedes-Benz is promoting its V-Class series by partnering with hotels in the Salzburg region of Austria to offer consumers a test drive during their vacation. Mercedes-Benz created a short social video to highlight the promotion, focusing on the beauty of the Austrian outdoors and how families on vacation can use the V-Class. Tailoring promotions to a specific demographic of consumers can help forge more intimate connections and show how a product can be used in real life (see story). For many automotive brands, mobility is a big part of the future. “Audi always is looking for ways to innovate on premium mobility,” Mr. Schneider said. “We believe that ‘premium’ will increasingly be defined as more flexibility and freedom of choice in the future.